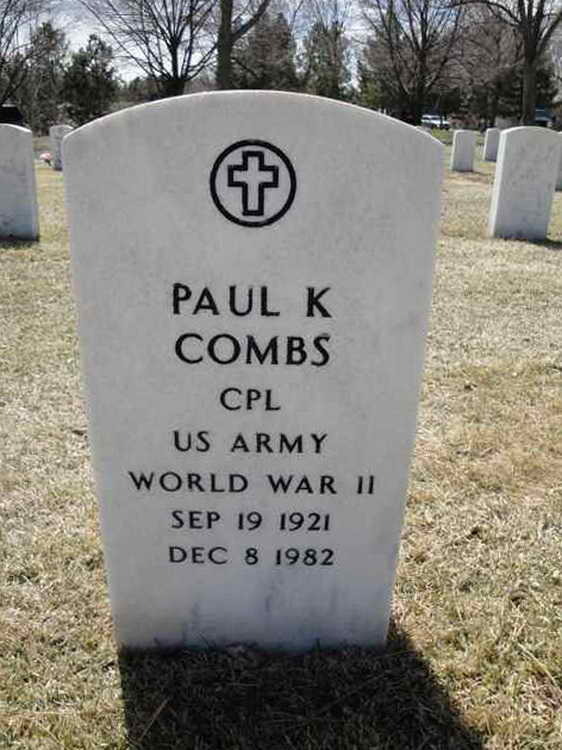 Grave marker for Paul K. Combs in Section S, Site 6101 of the Fort Logan National Cemetery, Denver (Denver county), Colorado. Paul enlisted at in the Army at Fort Leavenworth, KS on 4 March 1942. Pvt Combs was transferred to Company G, 508th PIR from the Parachute School, Fort Benning, GA on 7 august 1943. Pvt Combs was wounded in action on 3 July 1944 and evacuated to a field hospital. He returned to duty with the Company on 6 August 1944. He was wounded in action a second time on 23 September 1944 and once again was evacuated returning to duty on 28 September. His third combat campaign found him being wounded for the third time on 7 January 1945. It is not known whether he returned to the regiment. He was discharged on 28 September 1945. His military decorations include the Purple Heart with two Oak Leaf Clusters as well as the Combat Infantryman badge and the Bronze service Arrowhead devoice, both awarded for participation in the Normandy assault.